This modern European style home is being offered for rent in immaculate condition, boasting complete beauty, privacy, & security in one of the most exclusive gated beach communities in the area. The home is air conditioned throughout, with imported porcelain tiles, concrete and stucco construction, and was built to the highest quality of American standards. The entire property is secure with an 8 foot high cement wall boarding the perimeter, a fully enclosed garage, and iron roll up curtains to secure the house when you’re away for long periods of time. There is a recreation room as well as a separate living room that opens up to the outdoor pool and garden courtyard, landscaped to save on water. The kitchen comes fully equipped with imported laminate cabinets from France, which offer that sleek, bright, and stylish contemporary look. It has an electric oven range, convection oven and stainless steel convection hood. Complete with soft closing drawers, wine racks, and a full list of gourmet cooking appliances and utensils. Each bedroom is adorned with fine curtains imported from Europe, and stylish modern furniture and decor, with private bathrooms, and closets. The house comes fully furnished and is ready to move in or start renting. 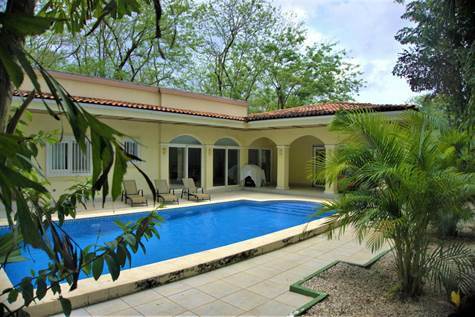 Located just 3 blocks from the beach in coveted Palm Beach Estates, Playa Grande.